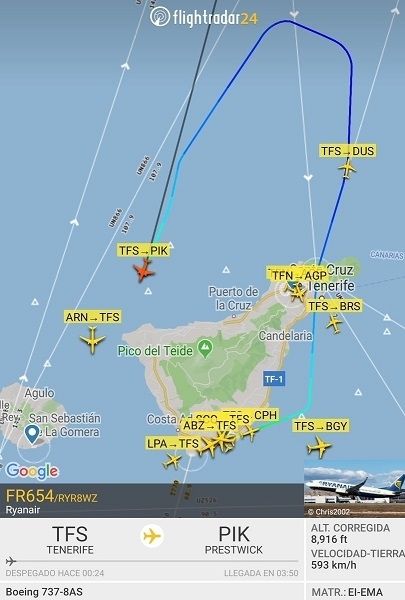 On Sunday, a Ryanair aircraft returned to Tenerife South Airport only 13 minutes after take-off. Shortly after take-off for the destination Prestwick in Scotland, one of the pilots had such massive medical problems in the cabin that the crew asked for return and landing permission. As planned in such cases, the emergency protocol was activated and the airspace for the aircraft was cleared so that it could return by the shortest route. Emergency services were already waiting for the aircraft on the tarmac when it landed without incident. The pilot was treated immediately. Produced with news.CMS in 0,0734 seconds.